Ski jumping is a form of Nordic skiing in which athletes descend a specially constructed takeoff ramp (known as the inrun), jump from the end of it (the table) with as much power as they can generate, and “fly” as far as possible down a steeply sloped hill. Points are awarded for distance and style by five judges, with competition sanctioned by the International Ski Federation (FIS). 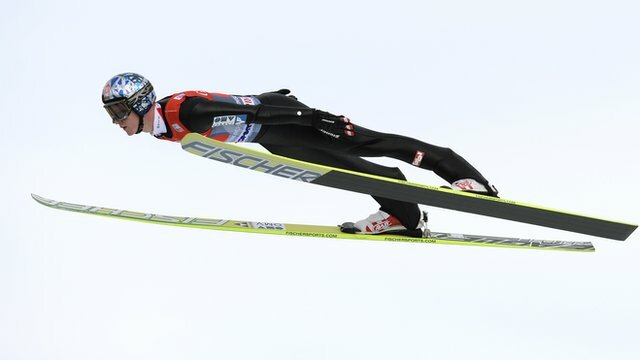 To enable the athletes (who are known as ski jumpers) to effectively glide such long distances and land safely, the skis they use are considerably wider and longer than their cross-country and alpine skiing counterparts. Ski jumping is predominantly a winter sport and has been part of the Winter Olympic Games since its inception in 1924, but it can also be performed in the summer on artificial surfaces made from plastic. Along with cross-country skiing, ski jumping is one of two sports which form the Nordic combined discipline.